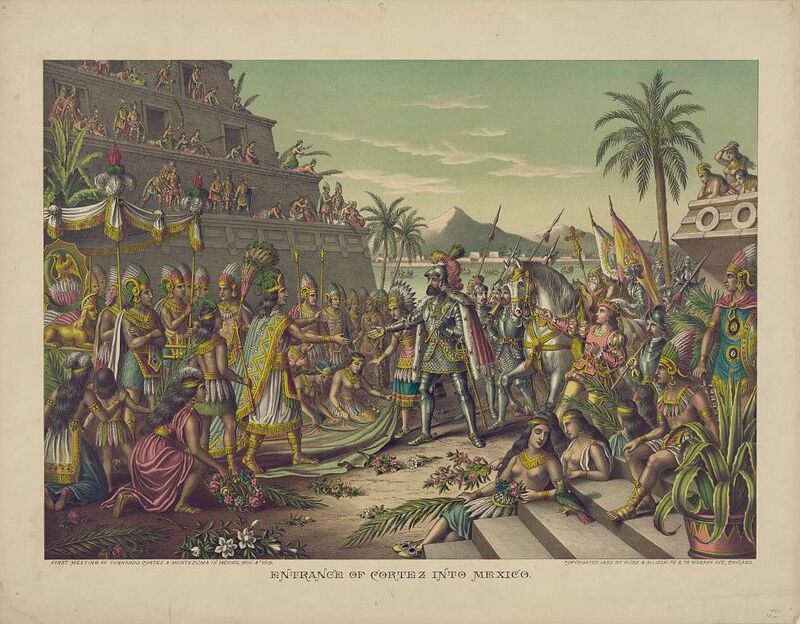 Upon entering the city of Tenochtitlan, on November 8, 1519, the meeting between Moctezuma and Hernán Cortés took place, with Doña Marina (La Malinche) as translator. Moctezuma II thought Spaniards had been sent by the god that would come from the East (Quetzalcóatl) and so, he was a magnificent host. He even presented Cortés, among other things, with the Headpiece of God Quetzalcóatl, also known as the Moctezuma Crest, wich was sent among other gifts, to the Imperial Spanish Court of Charles V.
Moctezuma lodged the Spanish soldiers in the temple of his ancestor Axayácatl (Moctezuma´s father), and they spent the following days visiting palaces and temples as well as the city of Tlatelolco. Upon the request of Cortés of building a catholic chapel, Moctezuma allowed them to do so, inside the palace where they were staying. While looking for a good place to build the chapel, they discovered a bricked space, where the treasure of Moctezuma´s father was hidden. Meanwhile, in the vicinity of Vera Cruz, the battle of Nautla took place, confronting the Mexicas and the Totonacas (Spanish allies). As a result of the conflict, eight Spaniards were killed, wich meant a discredit for them, as mexicas found that the Spanish soldiers were not semi-gods, and that they could be defeated.